OK, so I am reluctant to mention or recommend any mainstream films (or perhaps I should say any films in general). I am almost persuaded by David Murray’s argument that Christians just ought to do without them. 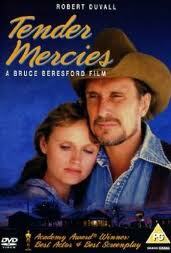 I heard a radio interview a few weeks back, however, with someone who was describing the 1983 move Tender Mercies as one of his favorites. In fact, he was describing this scene as one of the saddest ever filmed. I got intrigued by his description of the movie and got in on Netflix—It came right after Beauty and the Beast to give you some idea of the typical movie fare in our house. This got me thinking about what makes a “Christian” film. Tender Mercies (even the title comes from the Psalms and there is also reference to James 5:11: “Ye have heard of the patience of Job, and have seen the end of the Lord; that the Lord is very pitiful, and of tender mercy.”) is a “secular” film, but it also offers a very powerful presentation of Christianity. Yes, there are a few curse words in the beginning, realistically conveying Mac’s state and his world before his transformation begins (btw, another great scene is the truck ride back after the baptism when Mac and Sonny discuss whether or not their baptism has changed them, and they determine they are the same people, but they are changing—a nice portrayal of progressive sanctification). It also offers a powerful and winsome presentation of Christian marriage and fatherhood (much more compelling than, say, in the overtly “Christian” film Courageous, imho). There are not many films worth commending, but this might be one. What does "the old is better" mean in Luke 5:39?